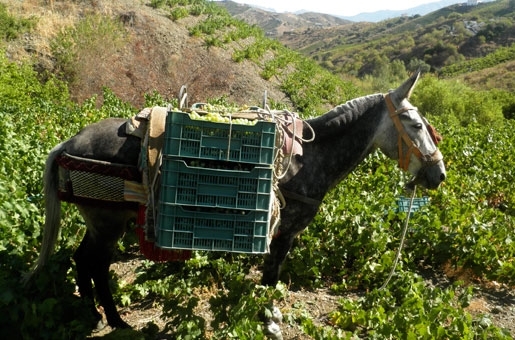 READY TO GO: Mules have been helping vine growers for generations. TIME marches on, but in some parts of the Axarquia traditional farming methods that have been use for thousands of years are still the only option available. The grape harvest season begins in August and in some towns, including Almachar, Cutar and El Borge this task is carried out following a long tradition. Most of the Axarquia vineyards, which make up 65 per cent of the vineyards in Malaga, are in difficult to access areas with up to 60 per cent gradients. This makes it impossible for vine growers to use tractors when harvesting grapes, so they use mules instead, emulating past generations. There are even areas where mules can’t access and farmers have to carry the grapes on their own. The Axarquia is one of the oldest wine-producing regions in the World. The first vines were brought by the Phoenicians and grapes have been cultivated ever since. According to Jorge Ordoñez Winery manager Victoria Ordoñez, the particularly hard geographic conditions of the Axarquia result in a very limited production, but of an excellent quality. A photographic contest to promote the Axarquia wine harvest season has been organised this year by the Jorge Ordoñez Winery in cooperation with the University of Malaga and the Malaga Provincial Government.